Download the installation package and save it to your computer. In order to install the required components double-click on both of the downloaded files and follow the instructions, an automatic installation process will start. It may take a few minutes. When web components are installed and ready for use, a message 'Installation was successful' is displayed. After the installation is complete you will find 3 new programs on your computer - ID-card Utility, DigiDoc4 Client, and DigiDoc4 Crypto. Mozilla Firefox - In order to use your e-Residency ID-card on your Mac, you'll need to install Mozilla Firefox, or update it if you already use it. 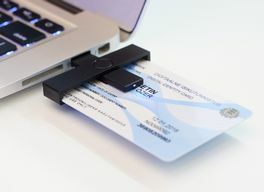 Connect your smart card reader to your computer, enter the ID-card and check whether your ID-card works at LeapIN or Eesti.ee.